Do you want to learn how to quickly & easily unfollow inactive accounts on twitter? If you’ve never heard of Manage Flitter, it is an excellent website that links up to your twitter account and is the simplest way to manage your unfollows. Ideally you want a ratio of more followers and than you are following. This post will describe a step by step guide of maximizing your unfollows per day the free way. Enjoy! Log into the twitter account that you’d like to manage. Make sure when you’re on www.manageflitter.com that you click the home button and then click START. If you have a large account and tweet quite a bit, it will take a few minutes to load page. You can use this time to thank your followers or make some coffee. You will then arrive at the managing your page part of the journey. At this point you can start to unfollow people, but the page only allows 100 unfollows per 24 hours. There is an easy “bypass” around this option. When you arrive at the Unfollow screen, at the top there should be a drop down popup that says bonus unfollows. 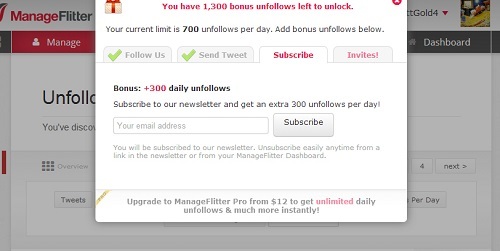 Click the pop up and you’ll be able to increase the amount of accounts you can unfollow per day. The pop up should expand and you will have the option of clicking on various tabs. Under the first tab, “Follow Us”, there will be an option to follow the manage flitter twitter page. When you follow them you will get an automatic +200 unfollows. 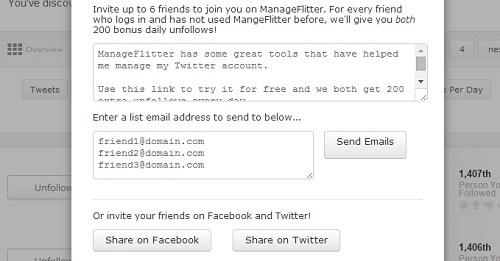 Next go to the “Send Tweet” tab and send out the pre-selected tweet about manage flitter on your twitter account. You will automatically get +200 additional unfollows for doing this. At the top of the tabs, it should display how many unfollows you can have per 24 hours. Click the “Subscribe” tab. This tab is interesting. You have to insert your email because you will get the newsletter sent to your email. With this option you will get an additional 300 unfollows to the 700 unfollows you currently have after completing the previous steps. Finally you arrive at the “Invites” tab. This option is the most crucial. You can attain up to 1,200 additional unfollows, but you have to invite up to 6 twitter accounts to join manage flitter and have them actually log in and use manage flitter. For each referral that successfully joins manage flitter you will get a +200 unfollow to the 1000 unfollows you currently possess. The only down side is you can only receive a max of +1200 unfollows. The total amount of unfollows at the end of this process should be 2200 unfollows per day. If you have a good budget and want an unlimited amount of unfollows per day then you can always pay $12 per month and get the unlimited amount of unfollows, which is perfect for small businesses. 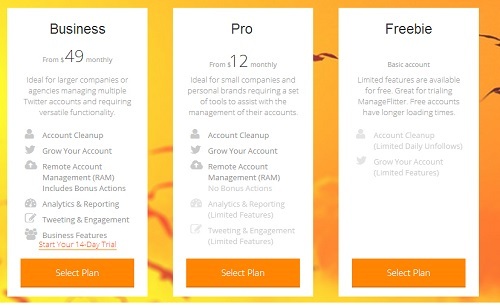 There is also the $49 per month which will give you more tools for you twitter account. This option is preferred for large businesses. At the bottom of the pop up from the previous tip, there should be an option to pay for unlimited follows, click it and you’ll arrive at this screen. Select your option and follow the steps. And it’s as simple as that! We love Manage Flitter here at ZD Design and think you will too! This entry was posted in Resources, Social Media, Twitter and tagged followers, following, manage twitter, twitter, twitter ratio.